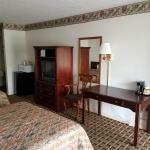 Imperial Lodge features free WiFi and rooms with air conditioning in Waverly. All rooms boast a flat-screen TV with cable channels and a private bathroom. The property offers a 24-hour front desk. At the motel each room is fitted with a desk. All guest rooms will provide guests with a microwave. Guests have access to the on-site business centre where they can use the fax machine and photocopier. Dickson is 42 km from Imperial Lodge.